Then followed 62 eastward across Oklahoma, through Indian country. This was dull but fast driving, which became much more interesting in the eastern part of the state as I approached the Ozarks and found myself in a land with hills and trees. In Bentonville, AR, I detoured four miles to the town square to check out the Wal-Mart Visitor Center, located inside Sam Walton's original store. 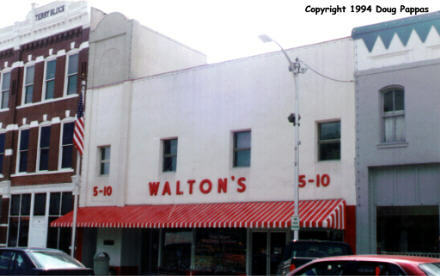 Walton began in 1945 with a franchised Ben Franklin Store, opening his first WalMart in 1962 after Ben Franklin Stores' management rejected his proposal for everyday low pricing. Thirty years later Wal-Mart was the biggest retailer in America - and when did you last see a Ben Franklin Store? Admission was free and, in the true Wal-Mart tradition, I was met by a greeter at the door. Inside, numerous displays told the story of Sam Walton and the business he built. A few miles east, at the Rogers airport, a traveling replica of the Vietnam Veterans' Memorial had attracted a host of visitors. They reacted much as I've seen at the Washington original, looking for names, making rubbings and leaving flowers. Then the road coursed up and down the Ozarks for 150 miles. Eureka Springs is the unofficial capital of the Arkansas Ozarks. A Victorian resort known as the "Switzerland of America," it now features winding, hilly "historic" streets with rambling old houses, plus any number of inexpensive, downscale tourist businesses on the fringes. The only one of these I visited was "Christ of the Ozarks," an immense statue at one end of a religious theme park. 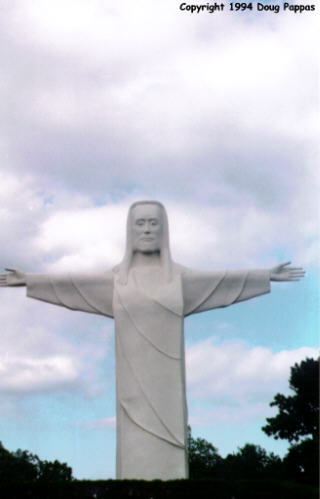 In addition to the 67-foot, million-pound Christ of the Ozarks statue, the park contains a 50-acre recreation of the Holy Land, a Bible museum, several chapels, and a gift shop selling titles like "The Bible and Rush Limbaugh." The entire project was created and funded by the late Gerald L.K. Smith, a rabble-rousing fundamentalist minister, Nazi sympathizer and vicious anti-Semite who's buried at the foot of the statue. Contemplating the poetic justice of Smith's tomb and bones being reduced to rubble if that seven-story Jesus should topple, I continued on to Mountain Home for the night.